After stumbling in Week 14 to their first losing week since Week 5, the Washington Capitals returned to their winning ways in Week 15, winning three of four games and earning points in all of them. It enable the Caps to retain a slim lead at the top of the Metropolitan Division and climb into second place in the Eastern Conference. For the second time this season, the Caps finished a four-game week without a loss in regulation. They also turned the trick in Week 8 when they won all four games on the schedule. And, it was a week of streaks. In opening the week with a 3-2 win in Detroit over the Red Wings, the Caps posted their fourth straight win over the Red Wings and the 11th straight game earning at least one point against Detroit (9-0-2). Washington followed up that win with a 5-3 decision over Philadelphia in the second game of the week, the first of four meetings of the clubs this season and a win that extended the Caps’ points streak on home ice to seven games against the Flyers (5-0-2). The two wins set the Caps up for a rematch against their Opening Night opponent, the Boston Bruins. The Caps did not dominate quite as completely as they did in the 7-0 lashing they gave the Bruins back in October, but the 4-2 win in Boston extended one of the strangest regular season streaks in the NHL. The win was the Caps’ 14th consecutive regular season win over the B’s. And it isn’t as if the Caps have been squeaking out wins against that team. They outscored Boston, 52-21, over those 14 games, and nine of the 14 wins were by multi-goal margins. The Caps fought off some misfortune in their last game of the week against the Columbus Blue Jackets to earn a standings point. Despite missing Alex Ovechkin for a stretch due to what was first described as an equipment problem (but would later be identified as a hand laceration that required stitches) and losing goalie Braden Holtby to an eye injury when Cam Atkinson’s stick clipped his mask, the Caps got a late goal from Evgeny Kuznetsov to tie the game and push it to overtime. Columbus won on an Artemi Panarin goal in overtime, but the standings point the Caps earned pushed their division lead to three points over the Pittsburgh Penguins. The seven points in four games for the week left the Caps with the league’s second best record in Week 15 (San Jose won all four games in which they played for eight points), picking up ground on 29 other teams in the league and leaving them still in first place in the Metropolitan Division. The seven-point week also enabled the Caps to vault past the Toronto Maple Leafs into second place in the Eastern Conference, 13 points behind the Tampa Bay Lightning. 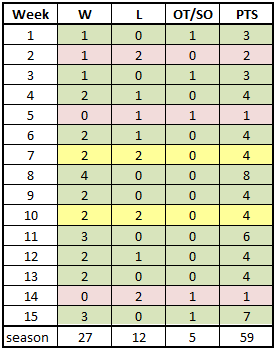 Offense for the Caps in Week 15 had a decided forward tilt to it. Of the 13 goals scored for the week 12 of them were by forwards, Jakub Vrana leading everyone with three goals. The two goals he scored in the Caps’ win over the Flyers allowed him to tie his previous best for a single season (13 last year) and then to pass it, that wone being the game-winner against Philadelphia. He recorded his 15th goal of the season in the Caps’ win over Boston on Thursday. Three other Caps recorded a pair of goals – Tome Wilson, T.J. Oshie, and Alex Ovechkin. Oshie and Ovechkin had two-goal games, Oshie’s (his second two-goal game this season) coming in the 5-3 win over the Flyers and Ovechkin’s coming in the 4-2 win over the Bruins. Oshie’s second goal against Philadelphia was an empty-netter, but it was also a shorthanded goal, his second as a Capital and the Caps’ third this season. Ovechkin’s two goals against Philadelphia was his 128th career multi-goal game, passing Jaromir Jagr and Mike Bossy for ninth-place on the all-time list. It also enabled him to pass Bobby Hull for 50th place on the all-time points list in the NHL (1,171). Wilson’s two goals continued an amazing start for the sixth-year forward. At week’s end he had 13 goals in 25 games, one within the career best of 14 that he set last season. His 0.52 goals per game at week’s end was 20th in the league among players appearing in at least 25 games. Oshie, Ovechkin, and Vrana led the team in points for the week (four apiece), while John Carlson led the defense (three). Michal Kempny, who is having a career year of his own, recorded the only goal by a defenseman, the game-winner in the Caps’ 3-2 win over Detroit to open the week. The goal was his fifth, almost as many as he recorded over the last three seasons before this one (six in 106 games). It was an iffy week for the Caps on the defensive side of the puck, but it was not an unusual week. The Caps allowed 184 shot attempts at 5-on-5 and were minus-11 for the week. It made for a shot attempts-for percentage at fives of 48.46, which is consistent with their performance this season to date (48.34 percent). The shots on goal performance alternated from very good to not so good. The Caps opened and closed the week being stingy in the shots allowed category, allowing Detroit only 25 shots on goal and Columbus only 22 shots on goal. The odd part there was in splitting those games and both being decided by one goal. In the two two-goal decisions the Caps did not fare very well in shots allowed, permitting 40 shots on goal to the Flyers in the 5-3 win and 41 shots to the Bruins in the 4-2 win in the middle games of the week. The Caps had an overall good week in goal, but a pall was cast over the performance when Braden Holtby had to leave Saturday’s contest against Columbus after Blue Jacket forward Cam Atkinson’s stick clipped Holtby under his mask and left him with a facial injury. He did not return to the contest. It was an unfortunate end to Holtby’s week. He stopped 72 of 77 shots (.935 save percentage) and won both of his decisions. What is more, he was consistent across periods, stopping 31 of 33 first period shots (.939), 23 of 25 second period shots (.920), and 18 of 19 third period shots (.947). Pheonix Copley was good in facing different situations. He faced a high volume of shots in his start against Philadelphia, allowing three goals on 40 shots in the 5-3 win, a performance that was marred only by a couple of goals late in the game when the contest was largely decided (the Flyers did get to within a goal with seven seconds left before the Caps iced it with an empty netter). Copley then was called into service when Holtby went out with his injury against Columbus. In 34 relief minutes he stopped all but the last shot he faced, 10 of 11 overall in being tagged with a hard-luck overtime loss. Even with the loss, Copley finished the week having earned points in his last nine decisions over ten appearances, going 7-0-2, 2.41, .923, with one shutout. The troubles continued on the power play in Week 15. 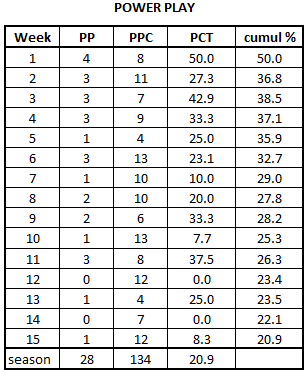 Firing blanks on 11 of 12 power play chances for the week, the Caps were under ten percent (8.3) for the third straight week in which they had ten or more chances (0.0 percent on 12 chances in Week 12 and 7.7 percent on 13 chances in Week 10). Week 15 was part of a longer dry spell for the Caps that has seen them go 6-for-56 (10.7 percent) over the last six weeks. Half of the six power play goals came in Week 11, and twice in those six weeks the Caps went without a power play goal entirely. Even the source of the power play goal was unusual. Jakub Vrana recorded that goal in the 5-3 win over Philadelphia. It was his first power play goal of the season. It was the lone bright spot in what was a frustrating week on the man advantage. The Caps just could not generate much, recording only nine shots on goal in 10:44 of power play ice time. Evgeny Kuznetsov led the Caps with three power play shots on goal for the week, while Alex Ovechkin was the only other Capital with more than one (two). It was two different weeks for the Caps. In the first one, the Caps killed off the first 12 shorthanded situations they faced. However, starting with a third period power play goal by the Bruins in the Caps’ 4-2 win over Boston, the Caps skated off only two of four shorthanded situations. It left them with a very good 14-for-16 week on the penalty kill, the 87.5 percent kill rate continuing what has been a nice recent trend. Over the last four weeks the Caps have killed off 35 of 41 power plays (85.4 percent). The Caps have the eighth-best penalty kill in the league over that span. 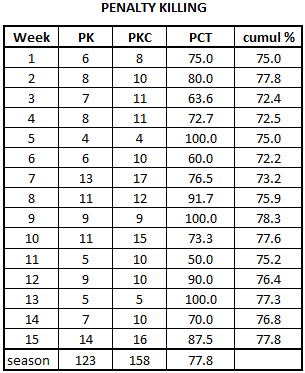 If there was a cloud over the penalty killing week, it was the frequency. The 16 shorthanded situations faced was the second highest total for a week this season, surpassed only by the 17 shorthanded situations that the Caps faced in Week 7 (they killed 13 of those for a 76.5 percent kill rate). Even with that, the Caps had a decent week limiting shots, holding four opponents to 23 shots on goal in 25:58 of shorthanded ice time. The blemish there was Boston recording 11 shots on goal with a power play in only 8:39 of power play ice time. If you are putting together a video for youngsters on how to take and win faceoffs, you will not use any clips of the Capitals in Week 15. There is no way to sugar coat this – they were terrible, individually and as a group. Individually, Lars Eller did finish the week over 50 percent (52.9 percent), the only Capital taking ten or more draws to do so. The other five Caps taking ten or more draws need some remedial work. 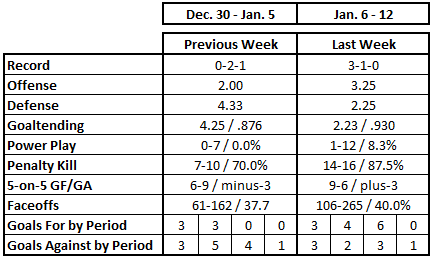 It was past disappointing and more alarming that Evgeny Kuznetsov finished the week 17-for-66 (25.8 percent). An offensive center who goes 4-for-24 in the offensive zone (16.7 percent) would seem to need to pay more attention to detail. It just is not an area of the game in which he has shown much progress. Through 15 weeks, Kuznetsov is 175th of 182 players taking at least 100 draws in faceoff winning percentage (38.9 percent), and no player taking more than 200 draws is worse. The Caps did win one game for the week, winning 40 of 76 draws against Columbus to close the week (52.6 percent). But it is part of a season-long problem for the Caps, who through 44 games in 15 weeks have double-digits in games with a faceoff winning percentage under 40 percent in games (10) as well as such games in which they won more than 50 percent of their draws (15). The Caps ended the week last in the league in faceoff winning percentage (46.4). It was a good week for the Caps for goals scored and allowed by period in one important respect. The Caps closed much better than they have in many weeks this season, doubling up on opponents, 6-3, in the third periods of games in Week 15. It was especially important in the last game of the week, when Evgeny Kuznetsov scored late in the third period to force overtime an enable the Caps to grab a hard-earned standings point in what was otherwise an extremely frustrating contest. 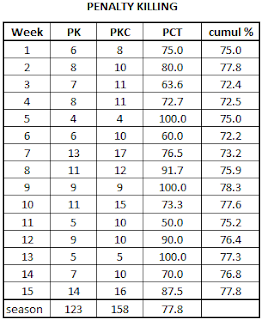 The Caps did not lose any regulation period for the week, the sort of consistency that makes for a successful week. Washington continued their middle period dominance, doubling up opponents by a 4-2 margin. The four goals brought their middle period total for the season to 62, tied with Pittsburgh for first in the league. Their plus-20 goal differential in the second period is second in the league (Tampa Bay is plus-29). 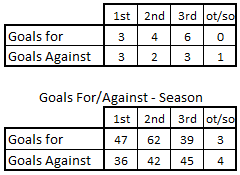 Once more, what is remarkable about the Caps in their year-over-year numbers after more than half the season is how similar those numbers are from last season to this. Washington had 27 wins after 44 games last season, and they have 27 wins in 44 games again. 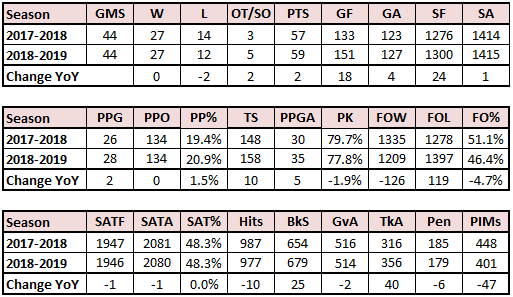 Two standings points better than last season, a four-goal difference in goals allowed, one shot more in more than 1,400 allowed in the two seasons, power play goals, power play chances, shot attempts for and against at 5-on-5; it is almost a duplication of last year’s performance. There are worse things one could say about a team trying to defend a Stanley Cup championship. That the Caps were able to grind out three wins and earn points in four games of a four-game sdchedule, despite the nature of opponents (two division rivals and one with particular motivation to end a long losing streak against the Caps), despite suffering an injury at two critical positions to arguably the team’s most important players (although both occurred in the last game of the week), and an especially frustrating game to end the week’s schedule, it made for a satisfying week on balance. This is a team that has shown a certain resiliency this season, dealing with more injuries than they did last year and battling opponents on a nightly basis that bring their best efforts against the defending champs. That resiliency would be sorely tested under the best of circumstances, but with injuries to Braden Holtby and Alex Ovechkin, a tighter race in the Metropolitan Division, and a difficult schedule leading up to the All-Star Game break that will see the Caps dealing with two back-to-back sets of games, it will not get easier.